"California", "Medicaid", "Obamacare", "health reform", "media-fail", "pre-existing conditions insurance plan"
A couple of months ago, my coworker told me about a young 19-year-old woman who is suffering from a tracheal infection that caused an open hole in her throat that she had to cover even in order to whisper. This young woman, formerly a singer, could no longer produce voice, and was in pain. Her tracheal infection does have a cure. It's a specialized surgery that only a few places have the expertise to perform. Luckily, one of those hospitals - the Stanford University hospital - is in the area. Unfortunately, this young woman did not have health insurance. She comes from a low-income family and is a student, but was not low-enough income to be eligible for Medicaid (at least that is what MediCal - California's Medicaid program - told her at the time). But private insurance wouldn't cover her either, both because she couldn't afford it and because her tracheal infection counted as a "pre-existing" condition. When I heard about this, the first thing that popped into my head was - ObamaCare! I was apparently the only one that my coworker knew with the knowledge that health reform could come to the rescue. California's federal pre-existing conditions insurance plan (PCIP) - funded by California's share of the $5 billion Congress provided to states to subsidize coverage for high-risk individuals until the exchanges open in 2014. I asked my coworker if I could talk to this young woman. We made an appointment and she came with her mom to my office. I showed them how to apply for for California's PCIP, and asked them to keep a private-insurance denial letter handy. A few weeks later, I was given the fantastic news that she had in fact qualified for a PCIP, and the premiums were reduced to $164 a month (from about $240 a month). Now she is preparing to have her medical records transferred to Stanford, and scheduling her surgery. In even more good news, she may now be eligible for Medicaid under California's expansion beyond the requirement of (but with partial funding assistance from) the ACA of our state's Medicaid (California is running a pilot program with counties to try to extend Medicaid to 200% of FPL). That's right. Half of the uninsured - the people that stand to gain the most from the Affordable Care Act - don't know that it will help them. 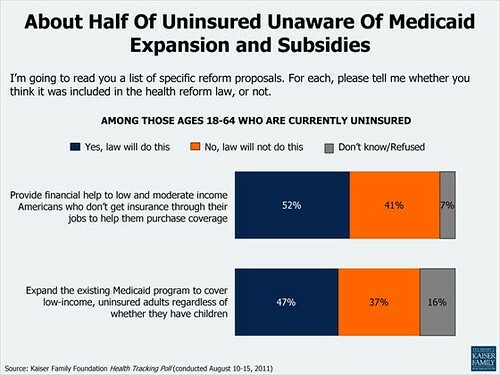 Among those who are currently uninsured, barely half (52%) know that health reform will provide subsidies to purchase insurance for low-income and middle-class Americans, and less than half (47%) know that Medicaid will be expanded to cover low-income, childless adults. Why don't they know it? Despite the White House's commendable efforts to inform the public about the truth of health reform and its positive impacts, the national media - traditional and Internet - have been dominated by ideological fervor rather than facts since the beginning of the health reform debate, and that flavor of coverage has continued to this day. A few good people (Ezra Klein comes to mind) on the major national outlets have tried to get the message out about what health reform actually does to improve the lives of real people (such as the premium subsidies and massive expansion of Medicaid, expansion of community health centers, banning pre-existing conditions discrimination and instituting community rating, better benefits in Medicare, helping early retirees and so much more), but they have been far overshadowed by colorful "news" coverage on health reform dominated by the theatrics, the court challenges, and the 'he-said, she-said' sensationalism of it. A ton more Americans know the term "ObamaCare" than know what's actually in it. The ideological fervor is intense on the Right - whose goal has always been to see President Obama fail. No one sane would expect any facts from them. But the truth of the matter is that the Professional Left's engagement in that ideological fervor has done just as much harm to the national discourse and contributed just as much in keeping people in the dark about health reform. Because the ideological pony of a 'public option' was not delivered (due to Congress not having the votes for it), the so-called Left media decided to turn itself into a echo-chamber of misinformation and lies about health reform. And when they didn't choose to lie, their coverage has been dominated by their perception of the president's personality, 'weakness' and 'selling out' - all centering around the public option pony and other anonymous, unfounded allegations. In either case, the media "gatekeepers" and "gatecrashers" alike on the Professional Left have failed to focus on the policy at hand in the zeal to beat up on President Obama to "look tough" themselves. Where these things have not themselves contributed to the misinformation campaign, they have given more fodder to other media outlets to present the story of health reform as a political catfight rather than a substantive though imperfect policy breakthrough that it actually is. This is why I was the only person in the vicinity of the people my coworker and her friends knew that knew about the pre-existing condition insurance plan. I am incredibly gratified and humbled that I was able to help this extraordinary young person literally find her voice once again. But you know what? Her future should not depend on a friend of a family friend who just happens to be there. What helped her was a new law that is saving American lives. One ought not need a 'Deaniac83' to be able to obtain benefits that one is entitled to. But she almost missed out on it because our media - Left and Right, traditional and non-traditional - has failed stunningly in informing the American people - especially those who will benefit from it - about the facts about health reform. We have freedom of press in this country. We have freedom of speech. And that's a great thing. But with great freedoms come great responsibilities. One of those responsibilities of the press must be to fully inform the American people about things that affect their lives deeply, as health reform already is. There is no doubt whatsoever that our 'free' press is selling itself to its corporate advertisers, earning points and ratings with sensationalism, and utterly failing to serve the public good. Such a weak, compromised press weakens our democracy. It weakens the people's access to information. We need an informed electorate, not a sensationalized press.